As part of Momenta, Biennale de l’image, OPTICA is presenting the work of French artist Valérie Mréjen, who is fascinated with vernacular forms of contemporary visual culture. For this exhibition, we are inviting youngsters to build a collective photo-story. Using collage, the participants will complete a story that gradually evolves on its own, from one intervention to the next. How does one tell stories through images? How can text influence the reading of the image, even change it altogether? In the framework of the solo show of Teja Gavanka, the young visitors will take part in an exhibition tour, followed by a workshop inspired by works presented at OPTICA. The artist Teja Gavankar subtly transforms the places she frequents. Come discover the artist and in return we invite you to modify the OPTICA Agora with construction block. You can start the activity whenever you want and do the workshop at your own pace. ollowing their visit, the young people will take part in a workshop inspired by the works presented at OPTICA. We offer convivial interactive visits and hands-on visual arts workshops where young people can learn to read and decode an artwork while sharing their observations in a group setting. After their visit, they will create a work inspired by the exhibitions they will have just seen. 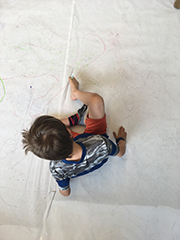 Our creative workshops allow children to learn by seeing and by doing, to better understand and appropriate the creative process of the artists in our programming. Since 2015, we have welcomed more than 400 children to our gallery. Guided tours of current exhibitions are offered to college and university students. On request, we can organize discussions or round tables on various themes such as OPTICA's mission, the mandate of artist-run center or any other subject related to the current art. These meetings take place in the AGORA space of OPTICA.